Deeside Gliding Club is awarded and recognised as a UK Junior Gliding Centre. Subject to completing the required training, you can fly a glider solo at age 14. And there is no upper age limit. 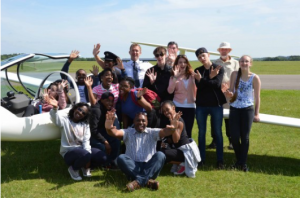 It is recognised that all young people can benefit from support in gliding. Deeside Gliding Club is part of the network of Junior Gliding Centres (JGCs) established by the British Gliding Association (BGA). We enable budding younger pilots (up to 25 years old) to meet up with each other, to develop your gliding skills and have a great time. For more information, please view the Junior Gliding section in the BGA website.